Click on the "Email" tab (in the manage toolbar). 5. 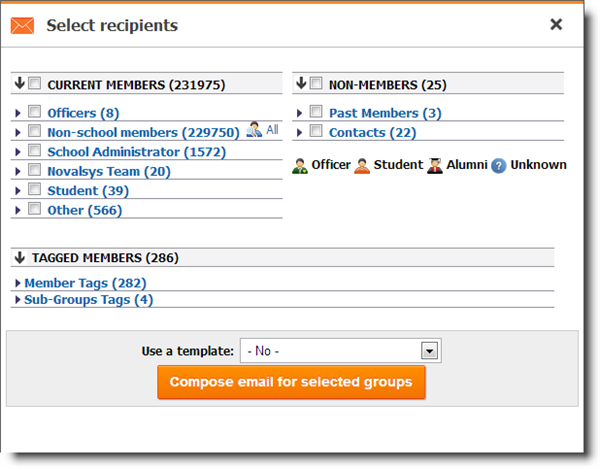 Select all users (current members) or specific user types (check categories), and click on the "Compose email for selected groups" button. Review the list of recipients. Choose a "From" email address. Compose your email (use templates if you like). 7. Once you have created the email, "Preview it first" before clicking on the "Save and Send" button. Note: You can publish an email as a newsletter to your web site by clicking on the "Publish As Newsletter" button.